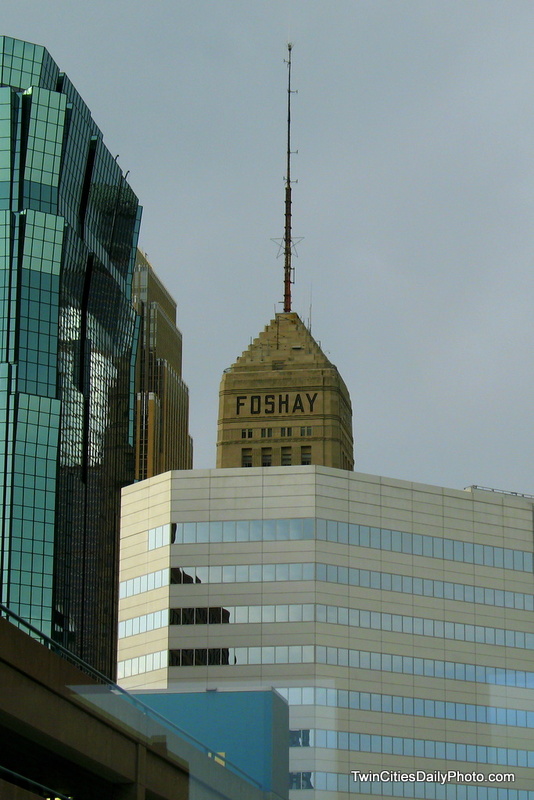 There was a time, when the 607 foot tall, Foshay Tower, now called "W Minneapolis - The Foshay" was the tallest building west of the Mississippi River. Today, it stands as the second tallest concrete structure, only to the Empire State Building is taller. Though, from this angle down on the street, to me, it appears as the tallest. If you look closely, the last stepping ring around the top, then it drops straight down, there is an observation deck that remains open. There have been some outstanding photos taken from the observation deck recently by some of the local bloggers. If you get a chance, stop by some of the daily photo blogs featured here on this site and do a search. I come from Twin Cities photoblog, and saw you had the same building posted and got curious of course! Great shot, and so different from the other one! The building to the left creates great reflections of the sky and building around! And it has a very interesting architecture! It is one of our favorite buildings, isn't it. What a coincidence that we both posted a photo of it on the same day.